THE QUEEN CITY OFFERS HOLIDAY ENTERTAINMENT | South Charlotte Newcomers! Christmas in Charlotte is a wonderful time for celebration! The Queen City celebrates the holidays all through December with a constant variety of food, fun and entertainment. Christmas Eve is a time of reflection and a time for festivities! Families can enjoy partaking a Christmas meal without the hassle of clean up and hours of cooking at several restaurants in the Charlotte area. An Italian Feast is a tradition for many families on Christmas Eve and there is no better place than Villa Antonio to sit back and enjoy some Italian delicacies. A Little Italy will be sure to be included in your holiday traditions for years to come! Buon Natale! Villa Antonio will be open Christmas Eve, with live entertainment, at an early 4:00 p.m.
Ruth’s Chris Steakhouse is a steak lover’s idea of a delicious Christmas heaven! This upscale restaurant will be open Christmas Eve from 4-9p.m. and will offer a children’s menu for your chicken finger and French fry picky eaters on Christmas Eve. McCormick and Schmick’s is open Christmas Eve for a sumptuous seafood supper in Charlotte! Offering a variety of fish entrees, steak and chicken, McCormick and Schmick’s can be counted on as a go-to restaurant with great food and service. The Ballantyne Hotel and Lodge offers a Winter Social Package that will include hors d’ oeuvres, three-course plated dinner and complimentary bartender service. Gallery Restaurant will be open for dinner on Christmas Eve, 4pm – 9pm. The restaurant will feature its regular menu as well as offer a prime rib dinner special on Christmas. Family activities and entertainment are easy in Charlotte through the holiday season. 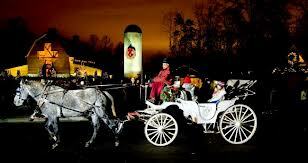 Bundle the family and guests into the car and find the many holiday cheer venues offered throughout the Charlotte area! On December 19 Red Green & Bluegrass Holiday Benefit will be performing at Museum of the Waxhaws. Located at 8215 Waxhaw Hwy.,in the quaint town of Waxhaw, North Carolina. Families will laughing and clapping to the beat of folk music and fiddlers! Charlotteans will be surprised to hear about the rich bluegrass musical history of their fine city! Cheer on The Charlotte Checkers, Charlotte’s hockey team on December 21st at Time Warner Cable Arena, 333 East Trade Street in Uptown. The Checkers will be playing against the Toronto Marlies. Tickets start at $15. The fun begins at 12:00 p.m.
Also on December 21st, sports enthusiasts can enjoy basketball at the Time Warner Cable Arena when the Charlotte Bobcats take on the Utah Jazz. The game begins at 7:30 p.m. and on December 23rd; the Bobcats will take on the Milwaukee Bucks at 7:00 p.m. at Time Warner Arena. The Carolina Panthers will provide some holiday football entertainment on December 22, at 1:00 p.m. The Panthers will be playing the New Orleans Saints at Bank of America Stadium, 800 South Mint Street in Uptown. Go Cats! Theater enthusiasts can enjoy holiday stage productions over the holidays. The Children’s Theater of Charlotte through December 22 will perform Miracle on 34th Street. Performances will be at the McColl Family Theater in ImaginON, 300 E. 7th Street. A Commedia Christmas Carol will be performed at the Wells Fargo Playhouse at ImaginOn, through December 29th. This traditional story starring Ebenezer Scrooge will be sure to keep you in the Christmas spirit! Christmas Town USA is the quiet little town of McAdenville. Every Christmas this sleepy town puts on a light display with more than 375 trees, with as many as 5,000 lights on just one tree! Homes and streets are all decorated with enthusiasm each year since 1956. Enjoy the Christmas light spectacle with more than 600,00 other people! Lights are on timers and automatically go off at 9:30 p.m. Monday-Thursdays and at 11:00 p.m. Saturdays and Sundays. Arriving in town by 5:30 p.m. and finding a parking space to enjoy the town while walking is strongly recommended. Also decked out for the holidays is the Charlotte Motor Speedway! Speedway Christmas returns for a spectacular holiday light show through December 30th. Three million lights in 800 displays will be shining the speedway along with a Christmas village, Santa and movies played on the worlds largest HDTV! The light show is open daily from 6-10p.m. Daniel Stowe Botanical Garden will celebrate Christmas with a festive display of Christmas trees, Santa and nature-based crafts. Enjoy the display of 500,00 lights while strolling the beautiful gardens! The North Carolina Transportation Museum will have a Santa Train with Santa riding the rails and passing out treats through December 22. Families can also take a 25-minute evening train ride to the Roadhouse where Santa and his elves will be waiting at Cookies With Santa, which runs through December 21st. http://www.billygrahamlibrary.org/ The Billy Graham Library celebrates the Christmas season with horse-drawn carriage rides, live music from carolers, a beautiful display of lights and a live nativity scene. Christmas dinner will be served at the Billy Graham Evangelistic Association headquarters. Christmas at the Billy Graham Library runs through December 23rd. Christmas in the Carolinas is filled with fun, love and good cheer! Merry Christmas Charlotte!